Leading aparthotel operator Supercity Aparthotels is set to open its latest property on 6th December in Manchester. Supercity’s first venture outside of London, you’ll find the quirky aparthotel on Church Street in Manchester’s ever bustling Northern Quarter. The new 68-suite aparthotel marries Supercity’s trademark understated elegance with a bold nod to the area’s love for street art. With all you’d expect from a Supercity Aparthotel, there are also amazing views as well as the usual flexible and friendly service with a dash of Northern charm – Church Street is just minutes from Manchester’s Piccadilly station. BETWEEN 6TH DECEMBER – 28 FEBRUARY*. +44 (0) 20 3818 9070. Supercity Aparthotels pair the comforts of home with many of the amenities associated with a boutique hotel and Church Street aparthotel is no different. All apartments include a living room, beautifully finished bathrooms (with complimentary Gilchrist & Soames toiletries), a super comfy bed/bedroom and a fully equipped kitchen. Guests also benefit from the use of a Handy smartphone, providing them with unlimited data, national & international calls and access to exclusive offers, free of charge for the duration of their stay. Guests can also enjoy panoramic views of the city through their floor-to-ceiling windows from the comfort of their own bed, or from the expansive roof terraces and balconies on the upper levels of the aparthotel. 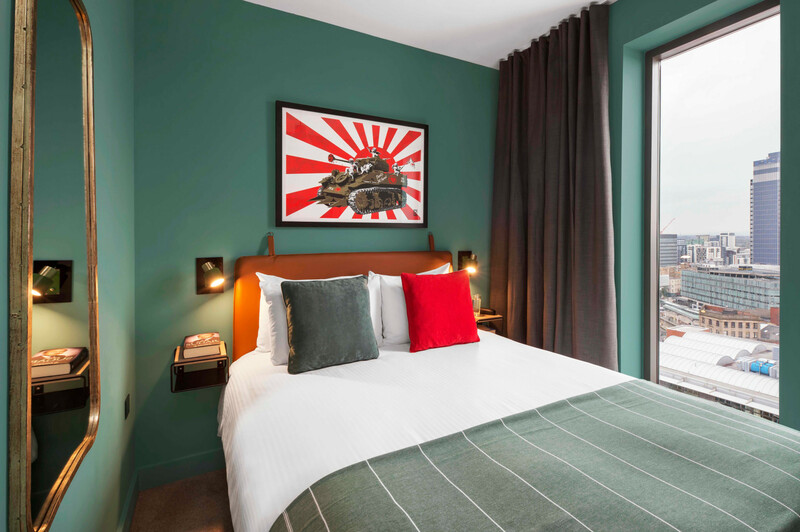 Drawing inspiration from the local area, each suite features bold colourways and textures of exposed urban concrete, complemented by bespoke artwork. Hallways are adorned with Manchester’s iconic ‘worker bees’ intricately curated by Stencil Artist DS, whilst living rooms are kitted with a striking diptych series by Creative Producer Ari Sturm, especially photographed for Supercity. An onsite gym, Sky TV, fast complimentary Wi-Fi and access to hundreds of digital newspapers and magazines via Newsstand come as standard. All-day dining and drinking will also be on hand courtesy of an independently-run integrated bar and restaurant space, set to open in 2019. Church Street by Supercity Aparthotels – all the advantages of an apartment with many of the benefits of a boutique hotel, right in the heart of Manchester.